Happiness Walkers and GNHUSA co-founders Ginny Sassaman and Paula Francis outside the Santa Fe “Radio Cafe” studio. 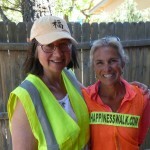 When the Happiness Walk was in Santa Fe for the last miles of Leg 9 — from Baton Rouge, Louisiana to New Mexico — we had the great fortune of being interviewed by local radio talk show legend, Mary-Charlotte for her “Radio Cafe” program on KFSR-FM. Mary-Charlotte talked with us for an hour, which allowed for some very penetrating questions and in-depth discussion. For days afterwards, people we met around Santa Fe would tell us, “We heard you on Mary-Charlotte!” Thanks to our great New Mexico pals Merle Lefkoff and Zelie Pollon for setting this up! You can listen to the interview in its entirety here.